Force Index Divergence Indicator generation III is modern indicator with complex mathematic algorithm (BJF Trading Group innovation). You will see divergenses on the chart and indicator. Arrows painted above/below the open bar and not in the past. You can see when actually you can trade. It is never to late! Signals based on closed bars so the arrows above/below open bar never disappear. Force Index Indicator measures the Bulls Power at each increase, and the Bulls Power at each decrease. It connects the basic elements of market information: price trend, its drops, and volumes of transactions. This index can be used as it is, but it is better to approximate it with the help of Moving Average. Approximation with the help a short moving average ( 2 intervals) contributes to finding the best opportunity to open and close positions. If the approximations is made with long moving average (period 13), the index shows the trends and their changes. If price changes do not correlate to the corresponding changes in volume, the force indicator stays on one level, which tells you the trend is going to change soon. The force of every market movement is characterized by its direction, scale and volume. If the closing price of the current bar is higher than the preceding bar, the force is positive. If the current closing price if lower than the preceding one, the force is negative. The greater the difference in prices is, the greater the force is. The greater the transaction volume is, the greater the force is. MA (ApPRICE, N, i-1) — any Moving Average of the previous bar. 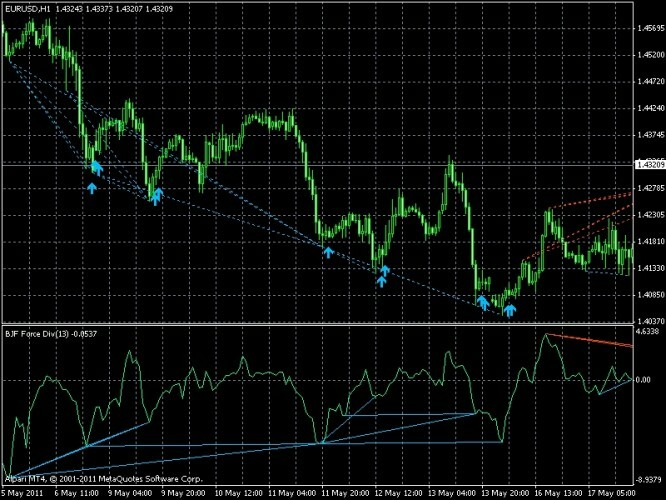 MT4 Indicator Force Divergence indicates fractal divergence by Force indicator. When divergence appears between Force and the price, it indicates a high probability that the current trend will finish soon. A signal to buy is when a new Low-fractal is formed below the previous one and a corresponding Force value is higher than the previous one. A signal to sell is when a new Up-fractal is formed above the previous one and a corresponding Force value is lower than the previous value. The indicator has a lot of customizable settings. The indicator has a lot of customizable settings. Divergences are crucially important when trading on the basis of force index. Bullish divergences occur when prices fall to a new low while force index makes a shallower bottom. Bullish divergences between two-day EMA of force index and price are strong buy signals. Strong sell signals are issued by bearish divergences between two-day EMA of force index and price. When prices rally to a new high while force index hits a lower second top, a bearish divergence is realized. A bearish divergence between 13-day EMA of force index and price is a strong indication to sell short. If prices reach a brand new high but the 13-day EMA of force index hits a lower peak, the bulls are losing control and the bears are ready to step in and take over. The continuance of a downtrend is typically indicated by the 13-day EMA of force index broaching a new low. If, by contrast, prices fall to a new low but the 13-day EMA of force index traces a shallower low, bears are losing their power. This is a bullish divergence, and it is a strong buy signal.